At this time came the Aunites (that is, the Danes) with innumerable armies to York, and they sacked the city, and they overcame it; and that was the beginning of harassment and misfortunes for the Britons; for it was not long before this that there had been every war and every trouble in Norway, and this was the source of that war in Norway: two younger sons of Albdan, king of Norway, drove out the eldest son, i.e. Ragnall son of Albdan, for fear that he would seize the kingship of Norway after their father. So Ragnall came with his three sons to the Orkneys. Ragnall stayed there then, with his youngest son. The older sons, however, filled with arrogance and rashness, proceeded with a large army, having mustered that army from all quarters, to march against the Franks and Saxons. They thought that their father would return to Norway immediately after their departure. Then their arrogance and their youthfulness incited them to voyage across the Cantabrian Ocean (i.e. the sea that is between Ireland and Spain) and they reached Spain, and they did many evil things in Spain, both destroying and plundering. After that they proceeded across the Gaditanean Straits (i.e. the place where the Irish Sea [sic] goes into the surrounding ocean), so that they reached Africa, and they waged war against the Mauritanians, and made a great slaughter of the Mauritanians. However, as they were going to this battle, one of the sons said to the other, ‘Brother,’ he said, ‘we are very foolish and mad to be killing ourselves going from country to country throughout the world, and not to be defending our own patrimony, and doing the will of our father, for he is alone now, sad and discouraged in a land not his own, since the other son whom we left along with him has been slain, as has been revealed to me.’ It would seem that that was revealed to him in a dream vision; and his Ragnall's other son was slain in battle; and moreover, the father himself barely escaped from that battle—which dream proved to be true. This is, of course, a most intriguing account, but two points in particular need to be noted. First, the text only survives in five fragments transcribed in the seventeenth century and appears to have its origin in the eleventh century, perhaps being composed during the latter part of the reign of Donnchad of Osraige (r. 1003–39), who was a descendant of the chief hero of the Fragmentary Annals, Cerball mac Dúnlainge of Osraige (r. 842–88). Second, the narrative preserved in the Fragmentary Annals not only probably dates from more than a century and a half after the events it purports to describe, but the FA moreover cannot be treated as a simple, reliable chronicle of events. Rather, it appears to be a composite text that derives from a number of pre-existing sources, including a derivative of the lost early to mid-tenth-century ‘Chronicle of Clonmacnoise’, a pseudo-historical narrative concerning the deeds of Cerball, and a handful of other sources including a Hiberno-Norse version of the legend of Ragnarr Loðbrók, with the African expedition believed to have its origins in the latter source. The final section of FA 330, detailing how the Vikings brought a 'great host' of North African captives back to Ireland, from O'Donovan's 1860 edition of the text; click the image for a larger view (image: Internet Archive). Majūs [Vikings]—God curse them—landed at Nakūr [Nekor, Morocco], in the year 244 (858–859). They took the city, plundered it, and made its inhabitants slaves, except those who saved themselves by flight. Among their prisoners were Ama al-Raḥmān and Khanūla, daughters of Wakif ibn-Mu'tasim ibn-Ṣāliḥ. [The emir] Muḥammed ransomed them. The Majūs stayed eight days in Nakūr. The same basic tale is recorded by a number of other writers too, including the tenth-century Andalusi historian Ibn al-Qūṭīya and the later authors Ibn Idhārī and Ibn Khaldūn, and a version also appears in the late ninth-century Christian Chronicle of Alfonso III, where it is related that the 'Northman pirates... sailed the sea and attacked Nekur, a city in Mauritania, and there they killed a vast number of Muslims.' Needless to say, the above is of considerable interest in the present context, and the reality of Viking activity in the region of Morocco is further supported by a recent analysis of bones of ancient mice recovered from the Portuguese island of Madeira, located off the coast of Morocco, which indicates that this island was probably visited by Vikings from Scandinavia/northern Germany in the tenth or early eleventh century, at least four centuries before the medieval Portuguese colonisation of the island. 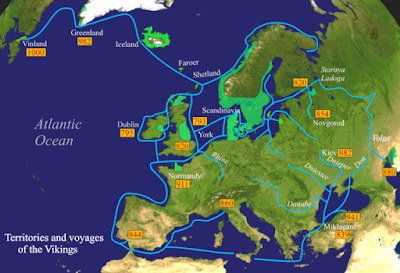 Map showing the territories and voyages of the Vikings, with dates for key settlements and expeditions (image: Wikimedia Commons). It would thus seem clear that the Vikings were active in the area of Morocco (ancient Mauretania) in the ninth and tenth centuries, just as the Fragmentary Annals claims, and that they moreover undertook a significant raid on the coast of Morocco—at Nakūr/Nekor—in the mid-ninth century that resulted in a significant number of slaves being taken. Indeed, in this light it might well be wondered whether the above raid on Nakūr/Nekor in 859 doesn't actually underlie the story of a mid-ninth-century North African adventure related in the Fragmentary Annals, as Janet Nelson has suggested. Of course, if the Viking raid on Morocco and the subsequent taking of captives there as described in the FA therefore has a good context in the real events of the 'Viking Age' and might even reflect a partially legendarised version of the raid on Nakūr, what then of the claim in the Fragmentary Annals that the North African captives were subsequently carried by the Vikings to Ireland and remained there 'for a long time'? Certainly, Ann Christys has noted that there is nothing inherently implausible about this final aspect of the FA's tale, especially given that other elements of the account appear to be historically credible and may derive from one or more real events. However, whilst other more reliable texts also mention Viking raids on the Moroccan coast and slaves being taken by them, none mention what happened to the non-royal prisoners that the Majūs (Vikings) captured in North Africa, only that the Emir of Córdoba ransomed the royal daughters of Wakif ibn-Mu'tasim ibn-Ṣāliḥ who were taken when the inhabitants of Nakūr were enslaved in 859. On the other hand, although external textual support for the final part of the account in the Fragmentary Annals may be lacking, there is nonetheless some archaeological evidence which, whilst not conclusive, is at the very least suggestive. 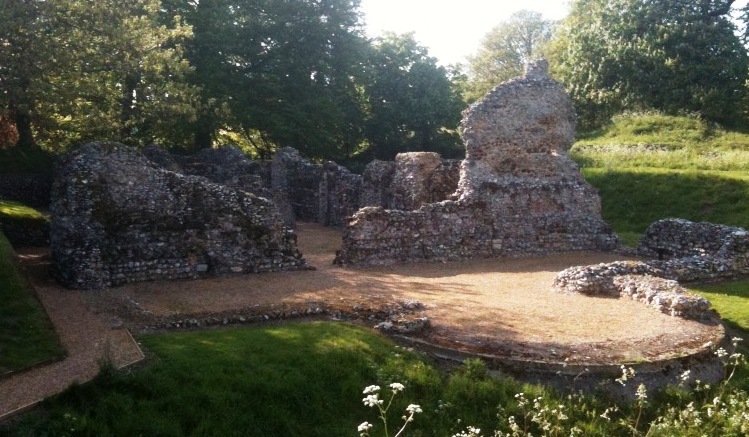 The archaeological evidence in question consists of three burials from early medieval Britain that have been identified as those of African women on the basis of an examination of their skeletal remains. One of the burials in question was discovered in 2013 at Fairford, Gloucestershire, and has been described as being that of 'a woman, aged between 18 and 24, from Sub-Saharan Africa', with radiocarbon analysis indicating that she very probably died at some point between AD 896 and 1025. Another was found in a Late Saxon cemetery at Norwich. And the third and best known is that of a young African woman buried c. 1000 in the Late Saxon cemetery at North Elmham, Norfolk. This last is discussed in detail in Calvin Wells' and Helen Cayton's contribution to the East Anglian Archaeology report on North Elmham, published in 1980, and also in Helen Cayton's 1977 PhD thesis, and whilst the identification was made from skeletal evidence alone (DNA analysis of the North Elmham woman's bones was planned in 2009, but was never carried out due to the relocation of the researcher), it is said to 'leave little doubt' and be 'incontestable'. Needless to say, if the identifications can indeed be relied upon, then these three burials are obviously of significant potential interest: although they were found in Britain, not Ireland, they do indicate that at least some people from Africa or of African descent were living and dying in rural and urban communities in the British Isles during the 'Viking Age' (eighth to eleventh centuries). Even though it is impossible to know quite how these specific women ended up in Britain, slavery has frequently been cited as a potential mechanism, and their presence would certainly seem to suggest that the claim that North African people taken captive by the Vikings ended up in the British Isles could have had some basis in reality. 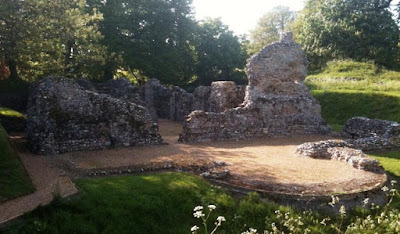 Ruins of a Norman chapel located on the site of the Late Saxon church and cemetery at North Elmham, Norfolk (image: Wikimedia Commons). The above is about as far as we can go at present. All told, whilst the eleventh-century Fragmentary Annals of Ireland is relatively late in date and often viewed with a degree of suspicion, it seems clear that some elements of its narrative of a Viking adventure in North Africa may well have a basis in real events. There is certainly good evidence to suggest that there was a significant Viking attack on Nakūr, Morocco, in 859 that saw the inhabitants of that city enslaved, and the notion that captives taken by the Vikings from North Africa were carried to Ireland, as the Fragmentary Annals claims, ought not to be summarily dismissed. Not only is there nothing inherently implausible about the notion, especially if we accept that the other aspects of the narrative have a basis in history, but there is also a small amount of archaeological evidence indicative of the presence of Africans in Viking-era Britain, at least, something that is of considerable potential interest in the present context.